Federal Reserve chair Janet Yellen is still doing her best impersonation of someone at NASA's Mission Control. She's preparing the market for an eventual liftoff for interest rates. Yellen told members of the House Financial Services Committee Wednesday morning that it will be appropriate to raise rates later this year -- as long as the job market continues to improve. Fed chairs testify twice a year before the House and Senate. Yellen's last appearance was in February. She faced tough questions from the House Wednesday morning and will speak to the Senate on Thursday. Many economists and Wall Street strategists expect the Fed to announce a rate hike at its September meeting. Yellen, in her prepared remarks before the House, did not specifically say rates would go up in September. But she strongly hinted that rates will go up sooner rather than later. Yellen once again dismissed the weakness in the economy during the first quarter. She referred to it as a "soft patch" due to "transitory" factors. She and several other Fed members have been saying that for months. She conceded that problems in Greece and China could hurt the U.S. economy, calling the situation in Greece "difficult" and that China "continues to grapple with the challenges posed by high debt, weak property markets, and volatile financial conditions." But Yellen suggested that some of the doom and gloom about Europe and Asia may be overdone. "Economic growth abroad could also pick up more quickly than observers generally anticipate, providing additional support for U.S. economic activity," she said, adding that low oil prices should eventually lift consumer spending. That hasn't happened yet though -- which is a bit of a concern. The government reported a surprise drop in retail sales in June on Tuesday. Retail sales have been relatively lackluster so far this year despite the huge drop in energy prices. But Yellen seems convinced that the U.S. economy is back on track. 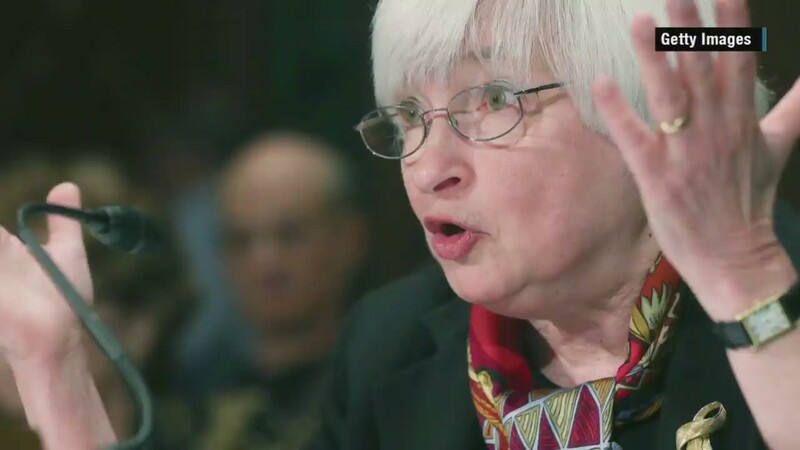 She reiterated that the Fed believes the unemployment rate will continue to drop gradually for the rest of the year. And that's one of the keys to a rate hike. While the Fed is also hoping to see inflation pick up modestly to prove that the economy is really on the mend, Yellen said the Fed is confident that inflation should move closer to its goal of 2%. During the question and answer session, Yellen said the Fed would probably raise rates gradually and that the first increase would not be steep -- especially if it acted sooner instead of waiting. The Fed slashed interest rates to near zero in December 2008 -- the height of the financial crisis. It has kept rates there since then. The last time the Fed actually raised rates was in June 2006. So there are some concerns about whether the Fed will be able to boost rates in a way that does not unsettle investors. Still, many of the questions from Congress had little to do with monetary policy. Yellen was grilled about transparency at the Fed, liquidity in the bond market, and predatory lending against minorities by financial companies among other topics.